Pinnies to make two even teams. Cones to define playing area (lots of cones if you are going to play outside). 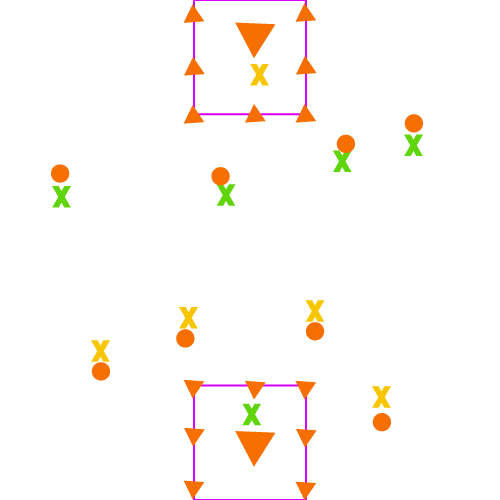 Using the basketball keys, place cones all around them (these are the goal areas), and in the center of each key, put a large traffic cone upside down, so that it is balancing on it’s apex. These are the two scoring areas. Each team selects a “goalie,” and this is the only person allowed in their scoring area. A point is scored when the other team’s cone is knocked over. 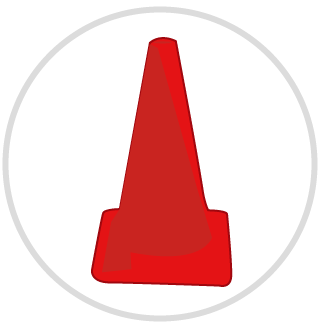 If the goalie accidentally knocks over the cone, it counts as a point for the other team. Play 5 on 5, plus two goalies (12 players on the floor at a time), and have the rest of the team sit on the bench and wait to sub in. Sub every two minutes by yelling switch, and don’t pause the game, as it will ensure a speedy transition. When a player is holding the ball, he is allowed to pivot like in basketball, can take 3 steps maximum, and can hold the ball for a maximum of 5 seconds. If a player breaks any of these rules, the referee blows the whistle, the offending player sets the ball on the ground, and play resumes as soon as someone from the opposing team picks up the ball. Players can not kick the ball, and must throw it to pass or shoot. If players are mature enough, they can be permitted to count out “5-steamboats,” as they guard their check to ensure that they are not holding onto the ball for longer than 5 seconds. Players are allowed to try and take the ball from other players, but are not allowed body contact (except for incidental body contact during play).